Thanks All for the lovely compliments. Took a few more pics and we played around with the ISO and this looks a teeny bit better. Also wanted to show the back, wherein there is pooling, but think that is from not removing enough from the waist seams.... despite that....... loooooooove it... on to the next project. Another take on Butterick 5672 (Modified): Close-fitting lined dress with left pleats, invisible zipper with sleeve options. Reviews of my modified versions here, here & here. Started on this dress during the Labor Day weekend and finally finished it this past weekend. Having made it several times, it should have been a quickie, however, that was not the case, my plan was to do something different with this dress. The fabric is a faux embroidered silk that I purchased at Virgo Fabric during mid-summer and knew immediately it needed to be a dress. I coined it carnival dress because of the vibrant embroidered design and the fact that I started working on it during the Labor Day weekend. Like the other reviews, I used the lining pieces to cut the dress & like my Lace dress went against the fabric suggestion and used a woven. I used the same grey knit lining that I used in my lace dress for this dress as well. I purchased the remaining 5/yds of lightweight knit from Flatbush Fabrics some time ago specifically for lining dresses. 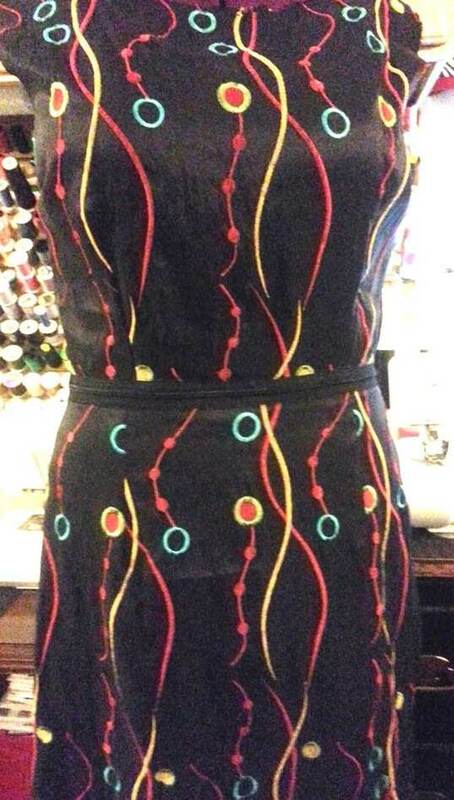 I was inspired by a zipper detail dress and decided that something along that detail would be perfect for this dress. I'm notorious for buying notions, although I have no plans for them at the time of purchase. I buy with the idea that just in case I need it and that was the case with the 52" zipper that I got from Sav-a-thon. 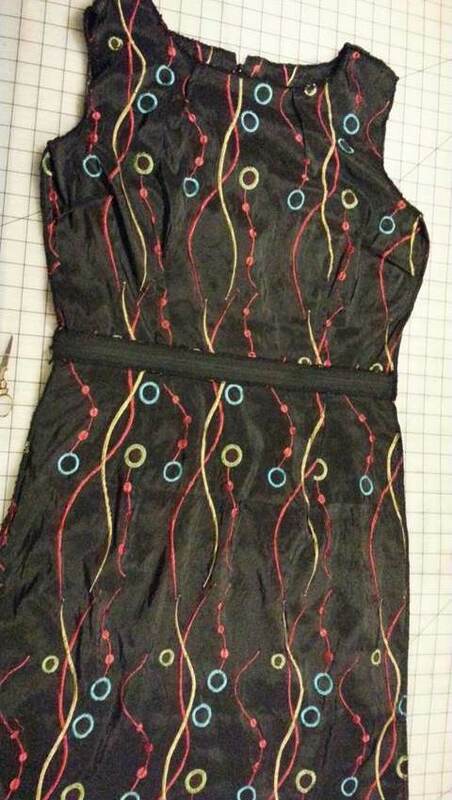 I only used the zipper for the front, and after sewing the waist darts, measured for the length I needed and made thread stoppers before cutting the zipper to desired length. Pinned one side of the zipper to the bodice edge and repeated the process for the skirt waist, thereafter, serged the seams. The back does not have the waist zipper detail just a center back zipper. Had to adjust the back, which was longer than the front, despite the added length in the front. I cut, give or take 1/4" from the bodice edge and the same for the skirt raw edge. The other detail that I added to the dress was black side panels. 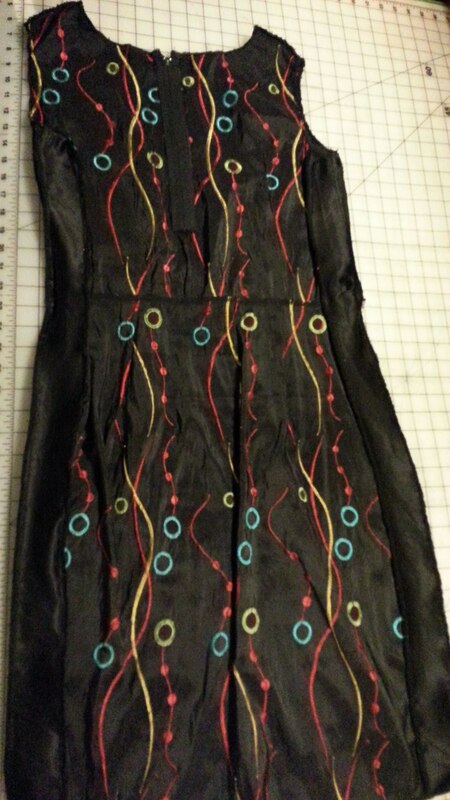 I cut two strips of black woven fabric 3" wide and a lil more than the length of the dress, pinned then machine basted the strips between the dress side seams. 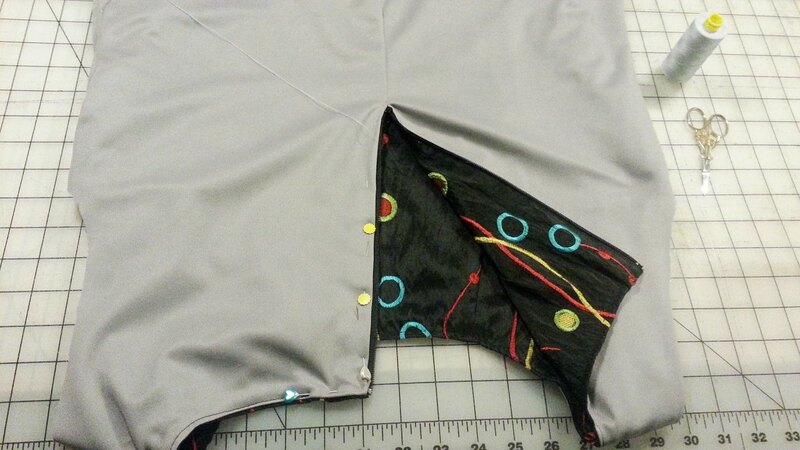 Of course, by adding the panels, it enlarged the armholes. With the dress wrong side out, pinched, give or take 1/8" either side of the panel seams and that fixed the enlarged armholes. For the lining I took a different stance, instead of cutting according to the pattern pieces (which has separate bodice front/back and front/back skirt) I pinned the pattern front bodice to the front skirt and repeated the process for the back, thereby cutting a full front and back lining. The lining was machined stitched at the neckline and hand stitched the lining to the zipper edges... as well as hand basted the lining of the armhole to the fashion fabric, then machine stitched. Finished off the dress by serging the hemline, folded to the inside, used steam-a-seam/lightweight heat-n-bond to finish the hem. The dress came out the just as I had envisioned... love it. Our point & shoot Kodak has been acting up and now my guy is using our fuji compact slr and boy-o-boy its a challenge finagling the settings. I love the sipper detail. Great looking dress. This is a great dress, Sheila. 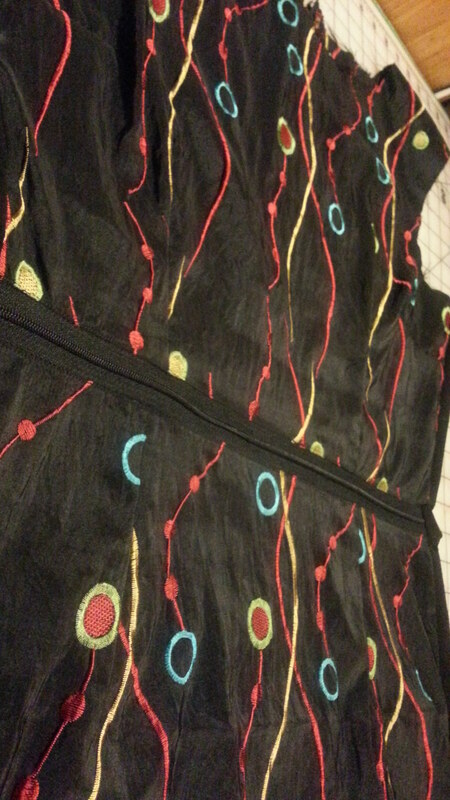 Love the fabric and the zipper. No worries about the pics... The beauty of the dress shines through! What lovely fabric! I really like this dress. The zipper detail is inspired! Sorry, I meant Zipper not sipper. Cute, cute dress, love the detail. Great job as usual. Love everything about this, dress, the shoes, the fit, the fabric. Fabulous!!! Gorgeous! 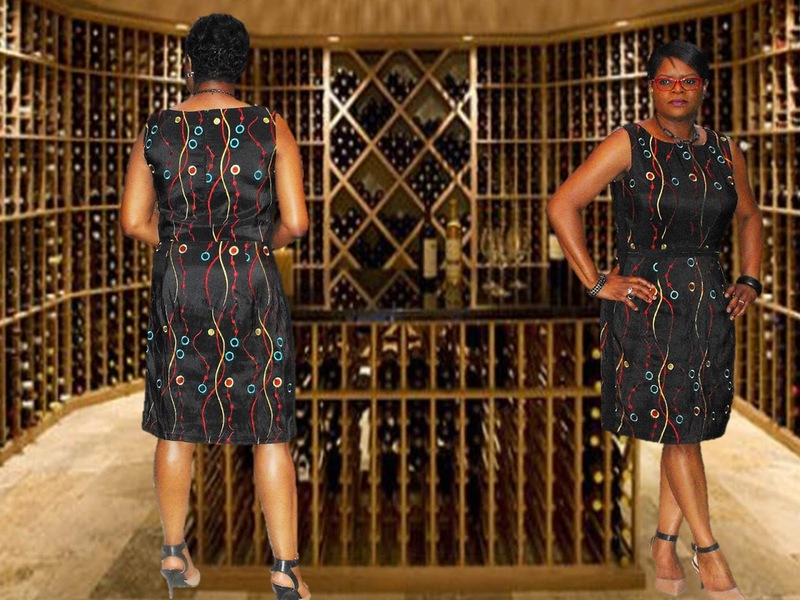 Great fabric - it really works with the pattern and fits you beautifully! Beautiful. The fabric says it all and great fit! I'm so glad you spotted this wonderful fabric. What a great dress! Another winner Sheila. I love the fabric. This dress is beautiful, love how you constructed it. The fabric is amazing. You did an excellent job with this dress. You're so talented, Sheila! The details in your dress are amazing. It fits you so nicely.